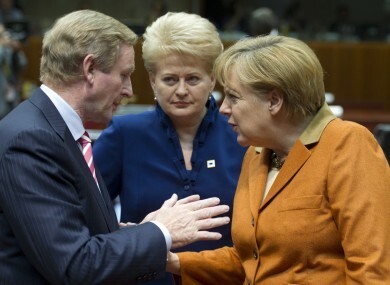 Enda Kenny speaking with Angela Merkel during the European Council meeting in Brussels on Thursday. Lithuanian president Dalia Grybauskaite looks on. JOBS MINISTER RICHARD Bruton has insisted that the agreement between EU leaders on addressing Ireland’s bank debt still stands despite comments from German chancellor Angela Merkel yesterday. Bruton was backing up the government’s continued insistence that negotiations surrounding the retroactive use of the eurozone bailout fund – the European Stability Mechanism (ESM) – to lessen the burden of Ireland’s bank debt are ongoing. This comes in spite of Merkel saying yesterday that retroactive direct capitalisation of banks was not possible in response to a question about the Spanish banking issue. Fianna Fáil has said that the government “seems to be in denial” about how significant Merkel’s comments are and said that comments from a German spokesperson today that it will continue to “co-operate closely” with the Irish government does not clarify the situation. McGrath said that the Germans had not clarified the situation and that a statement from the finance ministers of the Netherlands, Finland and Germany last month coupled with Merkel’s comments last night indicated “that legacy bank debt will not be addressed by the ESM”. On Saturday with Claire Byrne, Bruton was insisted that there would be “direct action on the sustainability of the Irish debt position” and was insistent that negotiations will continue. He added: “We’re used to seeing expressions of disbelief in one route or another but that’s the course of negotiation and we also have many allies. Sinn Féin leader Gerry Adams called on the government to change tactics and said that EU leaders and banks were not taking the Irish government seriously on the issue of bank debt. He said: “The fact is that this Government has never seriously sought a bank debt write down despite all its pre-election commitments and its recent public pronouncements. Instead they have borrowed €67 billion from the Troika and given €64 billion of this to the banks. Email “Govt insists agreement to address bank debt stands, FF says it's in denial ”. Feedback on “Govt insists agreement to address bank debt stands, FF says it's in denial ”.